What do I do with all the art and the crafts that my kids make? This is a question that I have often asked myself. I had piles of stuff throughout my house that the kids would make at school or at home. You hate to throw that stuff away, even though I do throw lots of it away. I try to save the good stuff, the cute stuff that only a 3 or 4 year-old could come up with, and the stuff that makes me laugh or reminds me of something. The rest of it goes in the garbage, and I pray that it does not get discovered there. I have a storage bin for each child that I keep in the attic and some of their stuff goes there. After 2 years in pre-school for Bella and 1 year for Jacob, their bins were filling up fast and I knew I needed another solution. We are fortunate to have a playroom in our house – a 1st floor room filled with toys, books, a train table, and even a television. The playroom is painted bright green and has white cube shelving with wicker baskets for storage. The planets of the solar system are hanging from the ceiling (in inflatable form), reminding us of Isabella’s obsession with all things space from the age of two and a half to just after her third birthday. The kids love playing in this room, and I love having a place to throw all the toys and kid related stuff that we have. 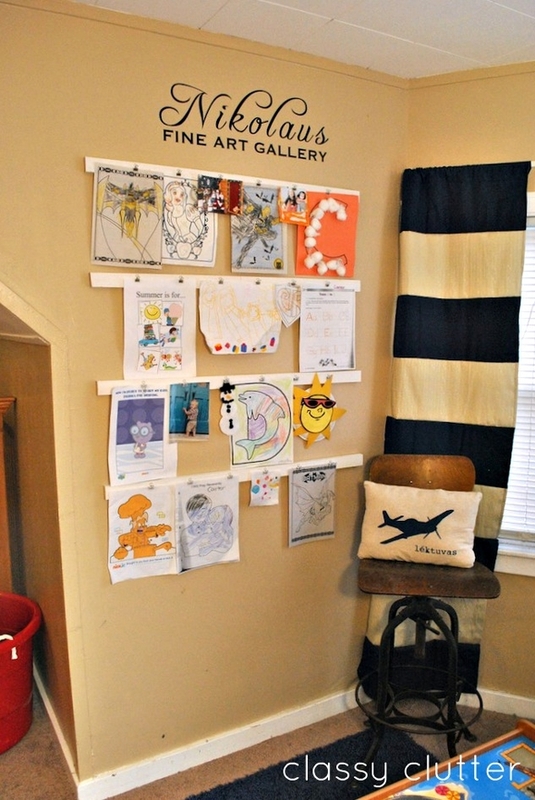 The playroom features a large wall, perfect for this idea I saw on Pinterest. The only problem is that I am not especially handy. I also did not want to spend a lot of money on wires and I could not get Ikea to ship me the cool looking metal and wire hanging system in the picture on the left. I went to the garage and gathered some heavy-duty string, nails, and thumb tacks. I hung the string horizontally using nails to secure the ends and thumb tacks evenly spaced across. The goal was to make sure the string stayed secure and taut, but to also leave space for clothes pin hooks to hold the actual art. I could fit three strings of hanging art on the wall. I have since added a fourth string and I plan to alternate the art on this fourth string the most frequently. This solution worked for us. It was cheap, easy to put up, did not take very long, and works. 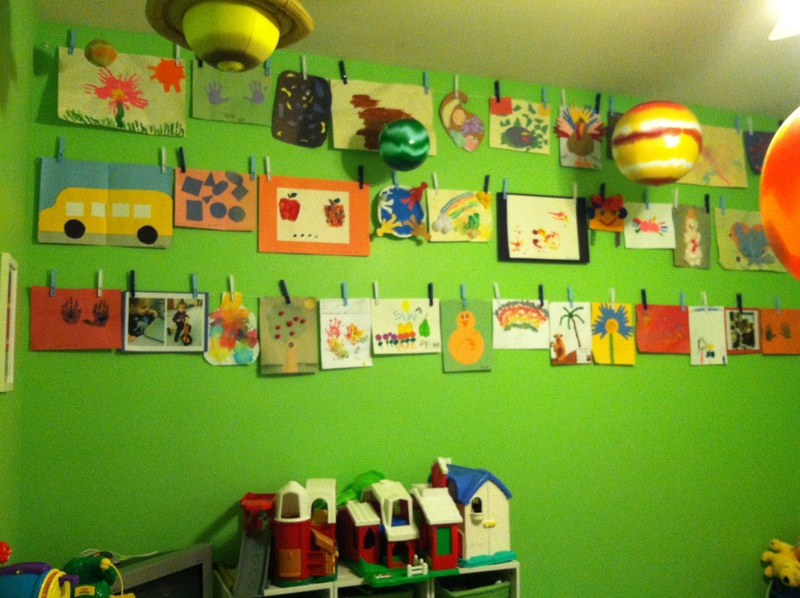 I love the bright colors and variety of pictures featured along this wall, and my kids love seeing their own art work on display for friends and relatives. I have another friend who takes pictures of the preschool art work and projects and saves them that way, saving memories and storage space. 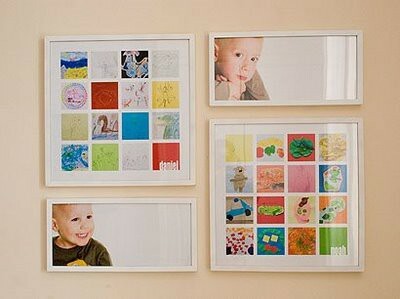 This picture below shows a creative and adorable way to display these photos of artwork in a way that does not take up very much room on a wall. 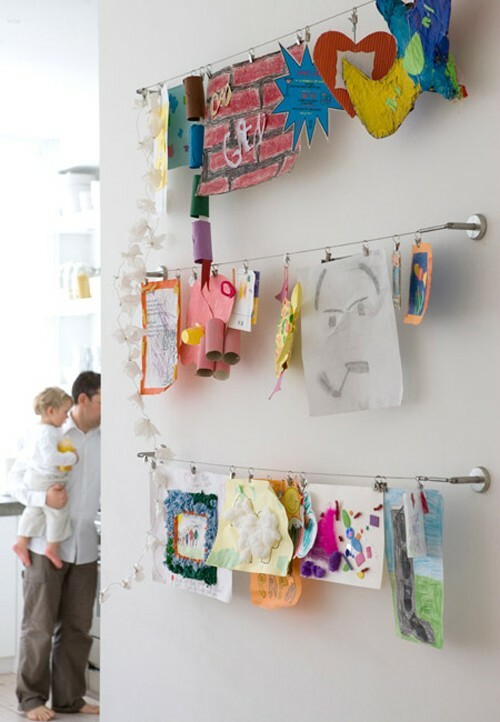 There are a lot of great ways to achieve the same end result – preserving and showing off your child’s masterpieces. I am thankful to Pinterest for exposing me to a few of these awesome ideas. I am proud of my makeshift version of a gallery and look forward to hanging many more new creations from summer camp and school in the future.